The Bass of Inverurie is to be the focus of one of my forthcoming digital reconstructions. This is a personal project which I am aiming to contribute to from time to time in-between other jobs but I hope to post my progress as I go. I welcome any help or advice, so please read on for more information and I would be grateful if you could share this with anyone you know who might be interested. At the end of this project, I hope to make all of this work freely available to the wider community for educational use as part of Scotland’s Year of History, Heritage and Archaeology 2017. 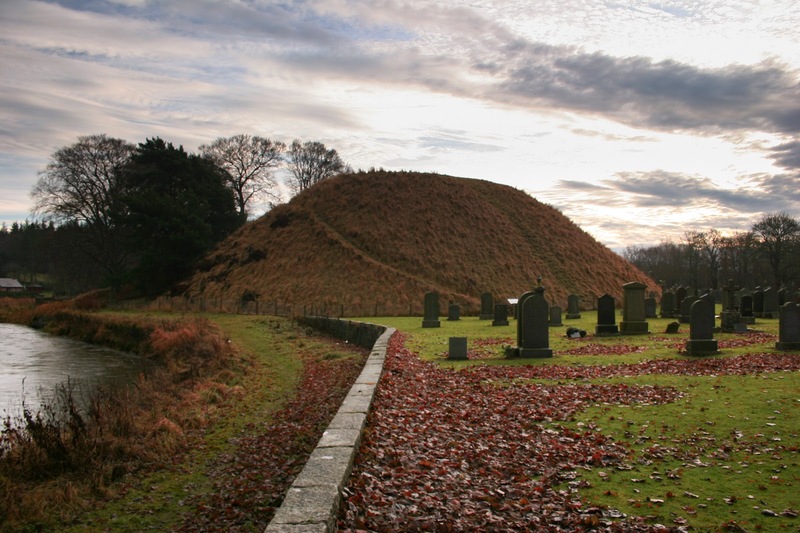 Located at the meeting point of the rivers Don and Urie, at Inverurie in Aberdeenshire, are the striking remains of a late 12th century Motte and Bailey Castle known as the Bass of Inverurie. It is a remarkable structure, for there are virtually none of these earlier period castles left in Scotland that are as well-preserved. Motte and bailey castles were once common right across the land, some 300 have been identified across Scotland, but most disappeared completely or were re-developed as the need for more substantial stone-built castles replaced them. I was born and brought up in rural Aberdeenshire, and I must have driven or cycled past the Bass of Inverurie on countless occasions. 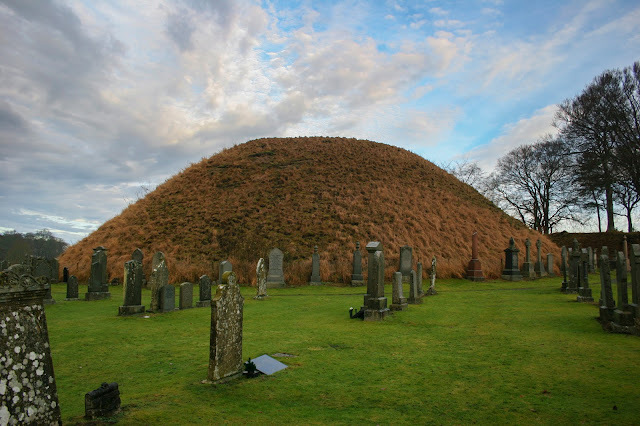 For a long time, I remained blissfully ignorant of its significance and I simply regarded it as a rather strange-looking mound in the middle of a cemetery. When I was a young lad, castles to me were grand and evocative places like Crathes, Craigievar, Fyvie, and Dunottar. Then after discovering a few books, I was amazed to learn that the mound I had so readily overlooked was actually once a very important castle and it is one that has captured my imagination and interest ever since. View of the Bass of Inverurie from the West. The 'Bass' was a very important fortress in its time. David, Earl of Huntingdon, who built it in the 1100s, was a member of the Royal Family - he being the brother of Malcolm IV, King of Scotland and the younger grandson of King David I of Scotland. An heir to the Scottish throne until the end of the 12th century, he owned rich estates in the East Midlands of England including Fotheringhay Castle. The Bass was used as a base by Robert the Bruce during the Battle of Barra in May 1308. In the battle, Bruce defeated his arch rival John Comyn, 3rd Earl of Buchan during the period of the Wars of Scottish Independence. Decorated pottery found at the site suggests that the castle was in use until the 14th century. It was never replaced with a stone castle. At this time Bruce's policy was to slight many Scottish Castles to prevent them falling into enemy hands. We can probably surmise that the Bass was one such victim, as the castle disappears from history on or after this point. The Bailey - view from the West. 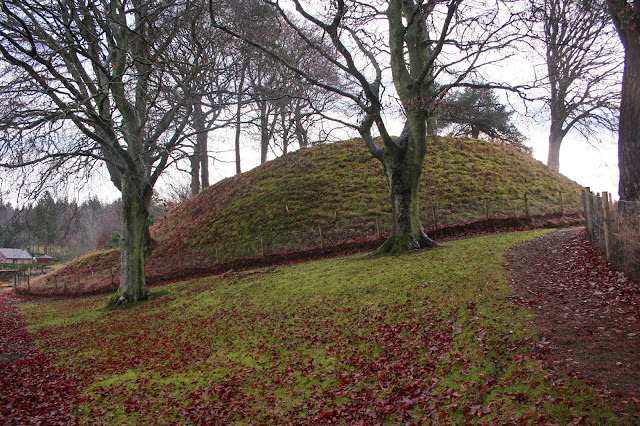 The castle comprises of two distinct man-made earthworks or mounds - the principle mound (the motte) rises to a height of approximately 15m and the second mound (the bailey) known as the Little Bass is roughly a third of the height of the motte. A high-sided timber palisade would have protected a two or three-storey timber-built tower at the summit of the motte. 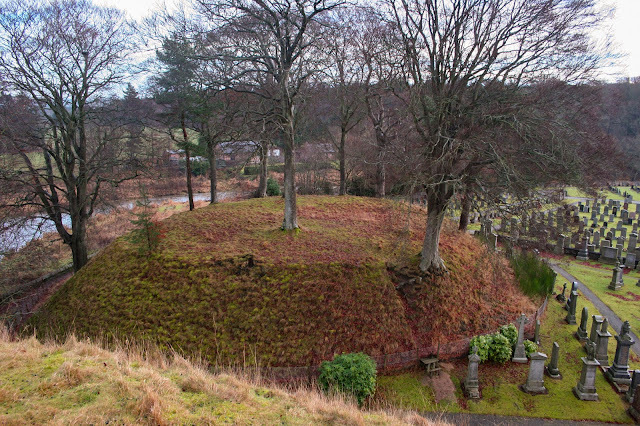 A series of steep wooden steps led up one side of this providing access to it from the lower mound or the bailey, traces of which were found in the late nineteenth century. A cluster of simple timber structures - most likely accommodation, kitchens, stores, stabling and workshops occupied the site of the bailey. A defensive ditch would have been excavated around the base of both mounds and the entrance to the bailey was reached via a gated drawbridge to the east side. To reach its entrance, one would have had to have walked right around the South side of the castle making it look very impressive indeed. But that probably had as much to do with defence since it gave the castle's inhabitants more time to observe approaching threats. The Bailey as seen from the top of the motte. I am attempting to produce a series of reconstruction visuals of the Bass of Inverurie using a blend of 3D models, land-based and aerial photography. I would like to produce an animated reconstruction if enough people are interested to see this, and I will try and upload a model to my Sketchfab page at the end. This is a personal project which I am doing as part of my interest in Scotland's earlier period of castle-building and I am using it to pilot some new visual techniques. I will probably attempt to visualise the castle at some point in its later life - perhaps around the time it was used as a base by Robert the Bruce, by which time the castle will have existed for around a hundred years. There are no records to describe what the castle actually looked like so my reconstruction will have to be speculative. I will draw on information and influences from what we know about other motte and bailey castles from other corners of Britain in this same period. I welcome suggestions and feedback from anyone who is interested in my project, whether you are from an academic background or if you simply share an interest in Scottish history. Please get in touch by email, leave your comments on this blog, or over on my Facebook page. And please do share this page with anyone who you think might be interested. I will be working on this periodically in between other projects and I will update this page with a few trial sketches, 3D models and other visuals as I go. My hope is to finish this project by the end of 2017 but it will depend on how busy I get with other work and how much help I can get from various sources. At the end of this project, my aim is to make as much of the work as I can, freely available to the wider community for educational use. Tabraham, C (2005) . Scotland's Castles. London: BT Batsford. ISBN 0 7134 8943 X. The bass is a natural mound which was converted to a motte by the scarping of its sides and the excavation of a ditch around it which is now infilled. 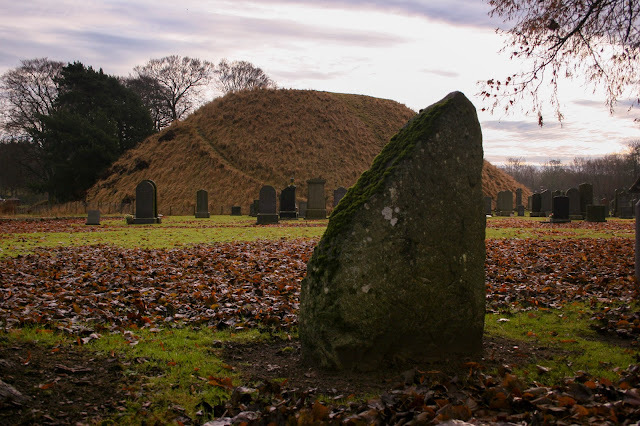 Source: Aberdeenshire Council Archaeology Services.